Overview - A group of horror fans find themselves unwilling participants in a nightmarish role playing game that pays homage to a classic horror film. Seven complete strangers whose only common link is a love for classic era horror films are invited to attend an exclusive 'horror fan' party at a remote farm. But as the sun sets, these strangers soon find themselves living a real life version of the cult horror classic, Night of the Living Dead. The strangers all bare a striking resemblance to the cast members from the Romero classic and waiting just outside the boarded up farmhouses, a group of demented sociopaths eager to 'mimic' the flesh eating zombies. Why watch a horror film when you can live one? Hidden beneath all of its bad acting, amateur scripting, and pedestrian direction, 'Mimesis' actually has a potentially interesting and even thought provoking premise. Unfortunately, unlike the zombies of classic horror cinema that the movie lovingly pays homage to, this inkling of merit can't quite claw through all the layers of dirt and grime that it's buried under. Unable to break free from a heavy grave of ineptitude, the flick ends up squandering its latent creativity on clunky plotting, terrible characters, and lifeless scares. 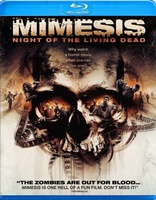 For the most part, this is one zombie flick that should have just stayed dead. Duane (Allen Maldonado) and Russell (Taylor Piedmonte) are two best friends who decide to attend a horror convention together. After the event, they're invited to an exclusive party where they drink and utterly fail to hit on girls. Also, they're drugged and forced to put on old fashioned clothing. When they wake up the next day, groggy and wearing someone else's wardrobe, the duo is understandably confused, but before they have time to decide whether they like their new duds, they're attacked by a gang of zombies. Now trapped in a secluded farmhouse with a motley crew of similarly dressed victims, the gang starts to realize that their whole predicament bears some startling parallels to the George Romero classic 'Night of the Living Dead.' With a pack of flesh-eating attackers patiently waiting to feast on their guts, the group will have to band together if they want to live and keep their brand new outfits. Stuck in a twisted role-playing scenario, our heroes scramble to survive and make sense of the whole crazy situation. 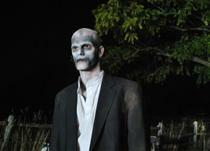 After all, zombies can't be real… can they? Before going any further, it's probably important to note that I've never seen 'Night of the Living Dead,' and so many of the movie's affectionate references failed to leave much of an impression on me. With that said, the characters frequently point out many of these connections themselves, and a TV in the farmhouse even plays a few clips from the Romero flick, further cluing in the uninitiated like myself. In fact, though it will undoubtedly play better toward fans, I think the filmmakers have done a pretty good job of making the movie accessible. Unfortunately, that's one of the only things they've done a good job with. This is an independent, low budget production so I don't want to be too hard on its technical shortcomings, but the cinematography and production design are all very bland and cheap. The visuals are competent, but that's about it, and the director frequently relies on an incredibly annoying stylistic device where the image will randomly speed up and slow down for no apparent reason. Some of the gore effects are decent, but the filmmakers occasionally resort to CG blood that looks rather ridiculous and out of place. With that said, there are a few gruesome set pieces that do prove to be effectively moody and borderline unsettling. Scary, however? Not so much. The usual assortment of desperate fear tactics are all employed, including loud music cues, but none of it leads to any legitimate frights. Of course, these predicaments might have been more alarming if any of the characters were actually worth caring about. As it stands, I sort of wanted them all to die. The acting in the early convention scenes isn't all too bad, but once the zombie mayhem starts, the groaning and eye-rolling begin. Flat and utterly laughable, the performances are quite terrible, and with the possible exception of the film's ultimate villain, none of the characters have any semblance of personality. They're written as generic cardboard cutouts, and the actors do very little to breathe any life into them. Jana Thompsons's Karen is perhaps the worst offender, as her character essentially becomes nothing more than a stilted mouthpiece for the most painfully obvious observations. Basically, her job is to constantly remind the audience that the group is being attacked by zombies. Yeah, we get it. We can see them too! The plotting itself is also full of unintentionally hilarious situations that are made all the more comical thanks to the poor performances and direction. Head-scratching decisions and truly idiotic planning pervade the characters' actions, and while dumb choices are a staple of the horror genre, here it's just kind of absurd. For instance, at one point in the film one character literally has a gaping, bloody hole in the middle of his throat -- and his friend's idea of medical attention is to rip off a piece of cloth and ever so delicately tie it around his neck. It's literally barely attached to him. So now not only is he dying, but he's also wearing a scarf. At least he'll be a stylish corpse. In the included commentary, the filmmakers go on to explain the technical reasons behind this inadvertently funny moment (too much pressure would have messed up the prosthetics) but when the results are so silly, you'd think that they would just abandon the idea and move on. Humorously inappropriate reactions (or non-reactions) also provide some laughter, especially during one scene where the characters hear a man slowly being eaten alive through a door and essentially respond with a haphazard shrug. While all this inept hilarity does lead to a marginal amount of fun, the movie never completely crosses into "so bad it's funny" territory. Mostly, it's just bad. Perhaps even more frustrating than all the problematic acting and scripting, is the fact that the core premise of 'Mimesis' actually has a lot of potential. Without giving too much away, the story has a fairly clever twist that elaborates on the self-referential, meta aspects of the plot, separating the flick from most other run-of-the-mill horror efforts. A darkly satirical undercurrent is revealed as well, and the film starts to delve into some legitimately interesting concepts dealing with the possible consequences of violent fiction and the pitfalls of life imitating art. Unfortunately, the filmmakers handle these ideas in the most shallow and immature way possible, leading to an ultimately mindless and thoroughly dumb experience. Despite some brief flashes of originality, 'Mimesis' is held back by amateur filmmaking and eye-rolling performances. The scares all fall flat, and the loving nods to 'Night of the Living Dead' add up to very little. The script shows the potential for a fun meta-fictional commentary on the genre, but the results are just stupid and boring. 'The Cabin in the Woods' this is not. Big fans of the Romero classic or contemporary low budget horror efforts might want to check this out, but all others will likely want to give this a pass. Anchor Bay brings 'Mimesis' to Blu-ray on a BD-25 disc housed a keepcase. After some warning and logos, the screen transitions to a standard menu. The packaging indicates that the release is region A coded. The movie is provided with a 1080p/AVC MPEG-4 transfer in the 2.35:1 aspect ratio. Shot on the Red One, the film has a competent but very cheap and underwhelming appearance that falls victim to occasional artifacts and visual anomalies. The digital source is home to a solid sense of detail with fairly sharp clarity. Unfortunately, artifacts like noise (particularly in dark scenes), aliasing, moiré patterns, and banding are visible from time to time and do prove to be distracting. Likewise, the image is very flat in appearance and lacks any real sense of dimension. Colors are desaturated and drab, but gory red blood does offer some muted pop. Whites tend to look blown out and black levels are inconsistent, wavering between deep and washed out. Most of the transfer's issues can likely be traced back to the movie's low budget roots, but the resulting image is still thoroughly mediocre and occasionally problematic. The film is presented with an English Dolby TrueHD 5.1 track along with optional English SDH and Spanish subtitles. While some of the effects work can be lively, the mix is annoyingly unbalanced and the sound design is pedestrian. Speech is reasonably clear but can sound thin and the dialogue is often mixed too low in comparison to the score and sound effects. The design work is aggressive but very basic and lacks any semblance of nuance. Loud music cues, creepy noises, and overpowered background ambiance (those have to be the loudest crickets I've ever heard) are spread around the soundstage, adding some jolt to the proceedings, but the mix is all one-note. Some effects carry much more emphasis than others and there doesn’t seem to be any rhyme or reason behind these fluctuations. While the aforementioned crickets blare from the speakers, other sounds like explosions are surprisingly muted. Though the mix can be pretty loud with solid bass activity, actual dynamic range is on the flat side. Oddly unbalanced and inconsistent, this is a serviceable but very amateur track. Audio Commentary - Director/co-writer Douglas Schulze and co-writer Joshua Wagner sit down together for this pretty dry and uneventful track. The duo details the film's inspirations, production scheduling, festival reactions, alternate titles, and how they went about accomplishing certain shots. They also reveal their hopes for a franchise of movies based on the premise (according to IMDB a short film sequel starring Kristy Swanson has already been shot). Fans might want to take a listen, but there really isn't much to gain here. While there's some merit in the core of its premise, 'Mimesis' is a thoroughly amateur horror flick. There's a few decent scenes, but the scares fall flat, and the performances and scripting are unintentionally funny. The video transfer and audio mix are serviceable but mediocre, and the only supplement is an uneventful commentary track. Horror fans might want to check the flick out for its loving homage to 'Night of the Living Dead,' but most audiences will want to skip this one.